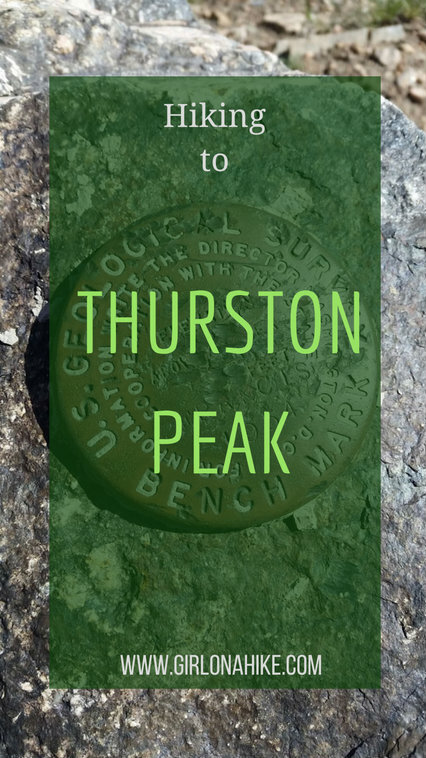 Thurston Peak (9,706 ft) straddles the Davis-Morgan county line, making it the tallest peak for both counties. 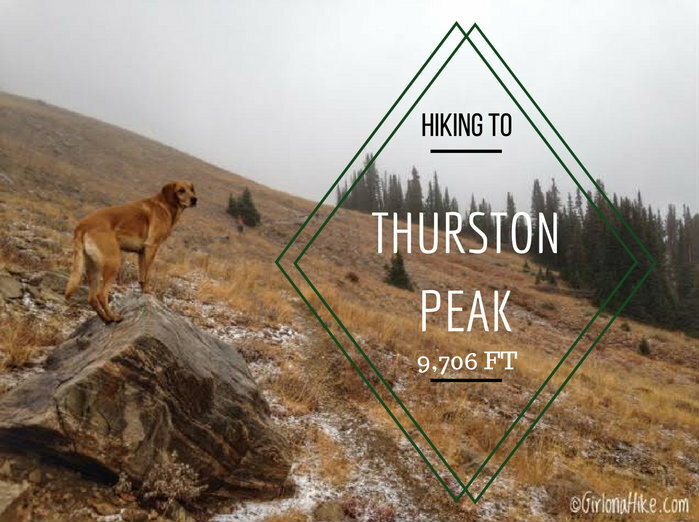 Many people think that Francis Peak, with the big white golf ball domes on the summit, is the highest peak along the ridge, but it is Thurston Peak that claims the high point. This is a relatively easy peak for Peak Baggers to summit, since it only gains 1,700 ft over 4.2 miles. 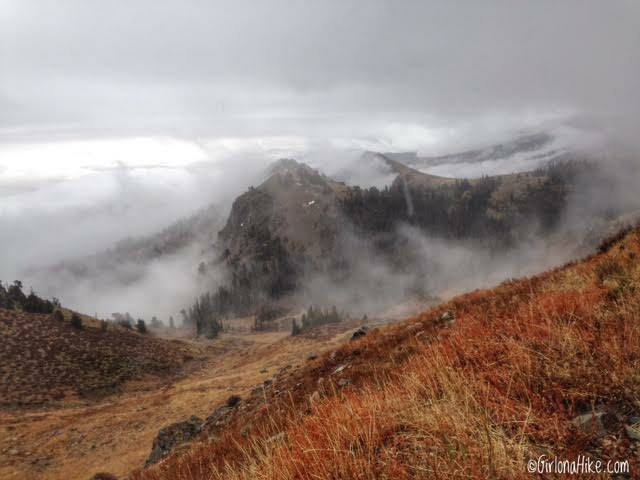 The high alpine setting has expansive views all around - Antelope Island to the West, Mt. Ogden to the North, and an overview of Morgan, UT to the East. This section of the trail between Francis & Thurston Peak is apart of the Great Western Trail, a continuous corridor of trails that stretches from Canada to Mexico and traverses some of the most beautiful scenery in the West. The first half of the trail is part of the old jeep road, and the second half follows a single-track trail. Because there is a winter gate at the bottom of Farmington Canyon, you can only hike here from July 1 through October 31st (unless, of course, you are up for a 16-20 mile day hike in snowshoes!). On older maps and guidebooks (pre-1993), Thurston Peak is referred to as North Francis Peak. 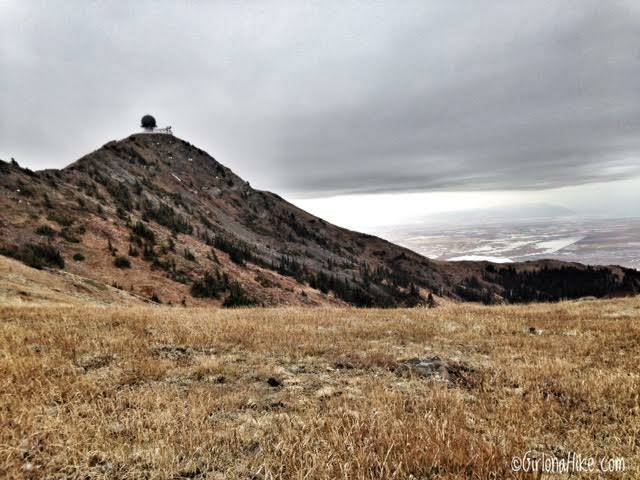 The original Francis Peak was named after a pioneer woman who helped early surveyors in the Layton/Farmington area. North Francis Peak was renamed in 1993 to Thurston Peak for a, you guessed it, a Mormon pionneer. His name was Thomas Jefferson Thurston, and he moved into the Morgan, UT area in 1852. He is credited for blazing a road through Weber County. From SLC head north on I-15 and take exit 395. Turn Right on Park Lane, then turn right again on Main St. Turn left onto 600 North, and turn left again onto 100 North. Drive 8 miles up Farmington Canyon. This quickly turns into a narrow dirt road, and a truck or jeep is ideal for driving this. A small car might make it, but after a recent storm or if a lot of ATVs use this road, it may be extremely rough. Once you reach two gates, turn left. and continue another 4.5 miles until you reach the large white radar/golf ball. Park here and begin hiking. There are no restrooms. Here is a driving map to where we started hiking and parked. 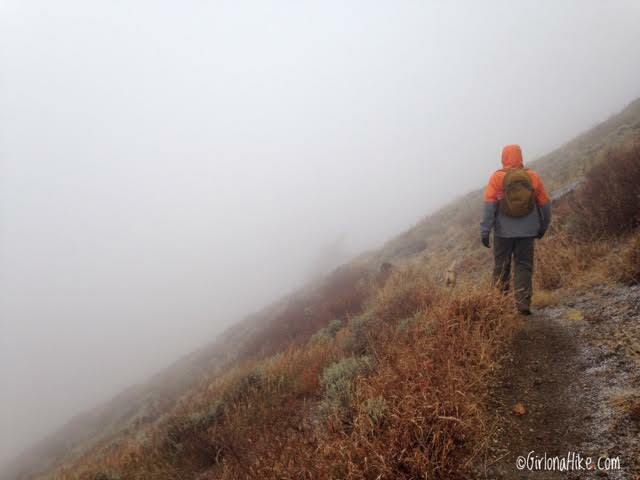 We hiked this during a rainstorm in the valley, but at this elevation we were socked in the clouds and mist. 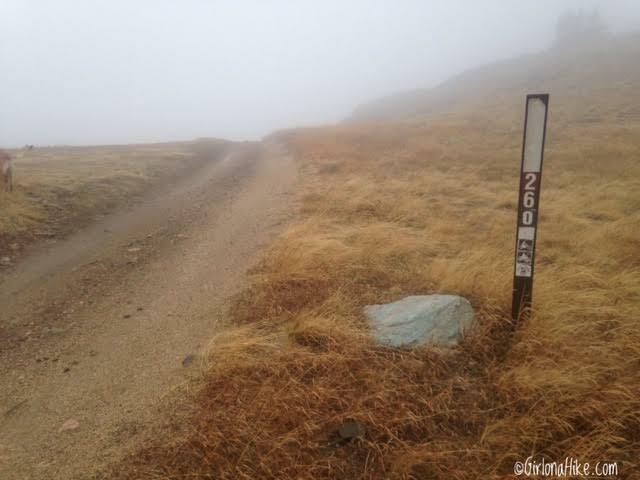 You'll start out by just walking along the old jeep road for about 1 3/4 miles. As the storm pushed through tiny pellets of ice/snow started to come down, and it hurt my face to look up. I was able to get a photo of Dan, ahead of me, walking into the clouds. 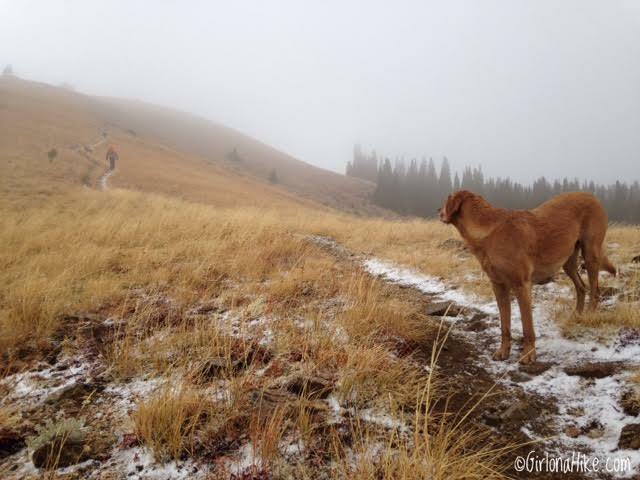 So glad a had a friend willing to hike through the storm with me! The clouds would clear on a off so that we could see more than just 100 ft. Once the road ends, the narrow trail continues along the ridge. Rather than hiking over each unnamed peak, the trail dips along the slope to an elevation as low as 9,000 ft. 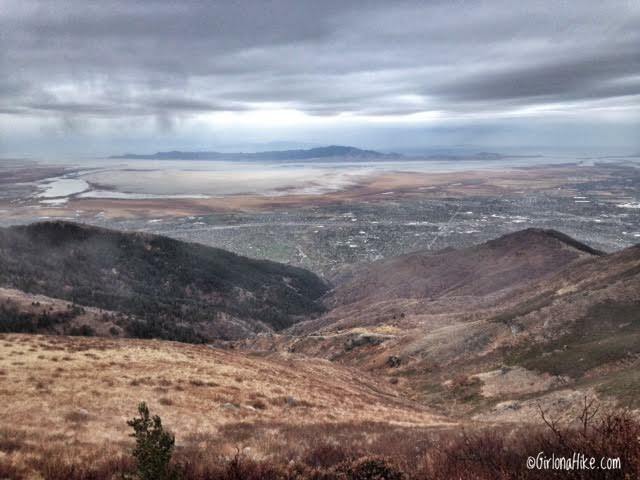 The trail favors staying on the West side of the Ridge (the Davis County side), but a few times will stay on the East. We were very thankful when we got to follow the trail on the East side to protect us from the strong winds coming from the West. Charlie looks ahead at one of the small saddles. 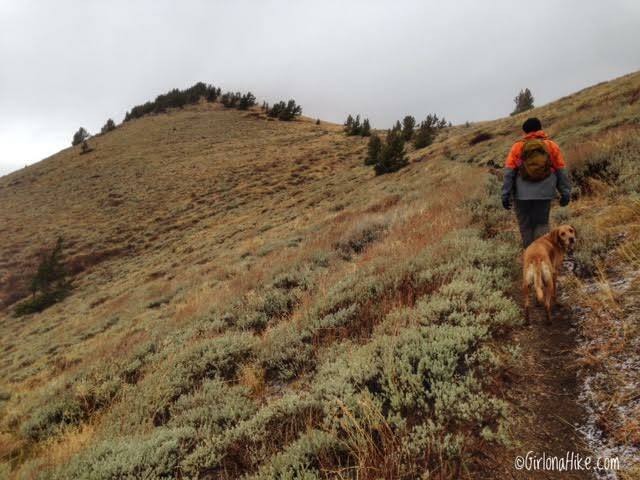 The West side of the trail is dotted with sage brush and grasslands - the East side is mostly pine trees. 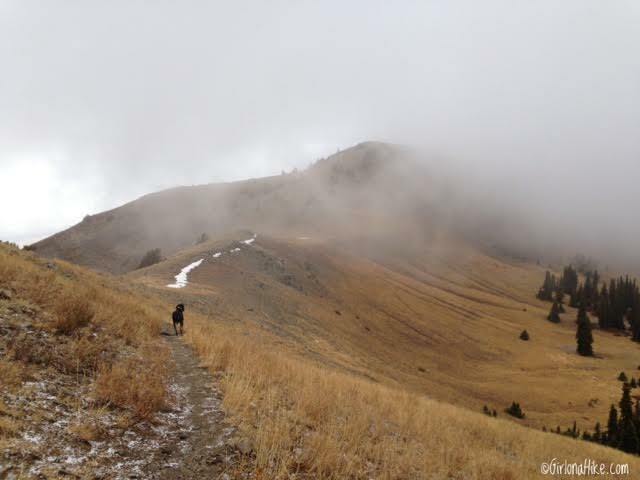 Working our way below an unnamed peak. Snow remains from the previous storm a few weeks prior. At exactly 4.0 miles, keep your eye our for this large cairn on another saddle. 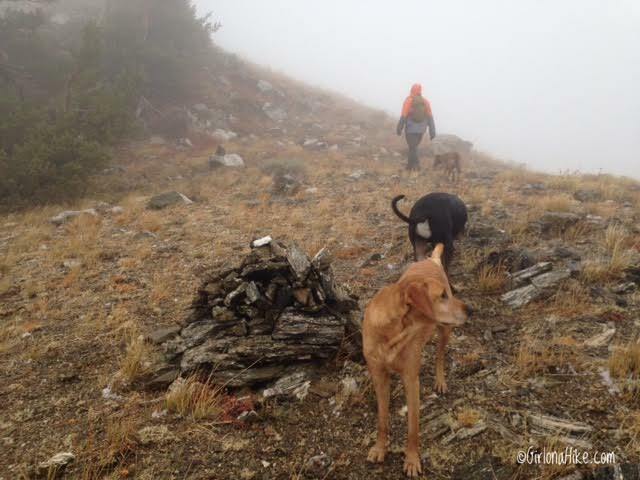 You'll leave the main trail, and follow the cairns up a poorly defined trail along the ridge for the last 0.2 miles. 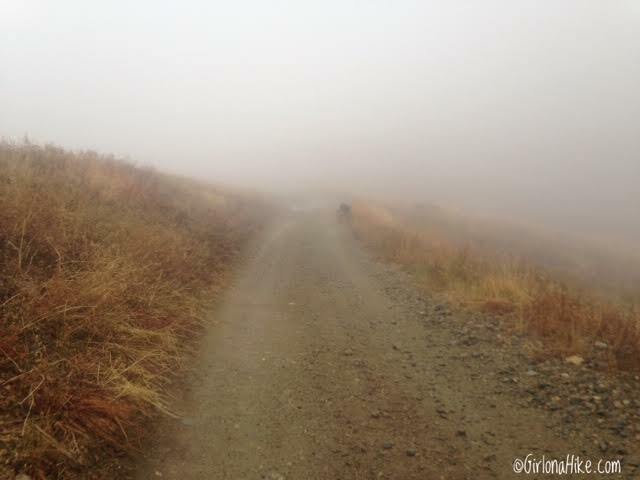 This last section is pretty steep, but keep an eye out for cairns to help guide you. Pink and black, marbled granite dots this ridgeline and slope, which will help you to know you are in the right area to start ascending. On the summit of Thurston Peak...and we couldn't see a darn thing!!! By now, the snow had really picked up. Supposedly the views are amazing - I wouldn't be able to tell you LOL! 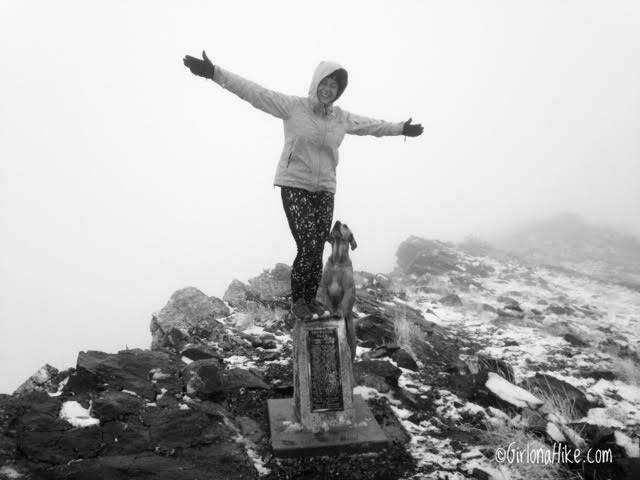 Oh well, not every hike will have perfect weather, and honestly, it was really fun hiking in snowing conditions for the first time this winter. I was glad I switched over to my Winter pack, with my gloves, beanie, and warmer puffy coats. You know you've reached the peak when you find this plaque and summit register. On our way back to the cars, the clouds opened up and we could clearly see Frary Peak to the West and Layton & Farmington below. ...5 minutes later we were socked in again. Crazy weather! Almost back to the cars and we had some awesome views of the lower mountains with clouds around them. 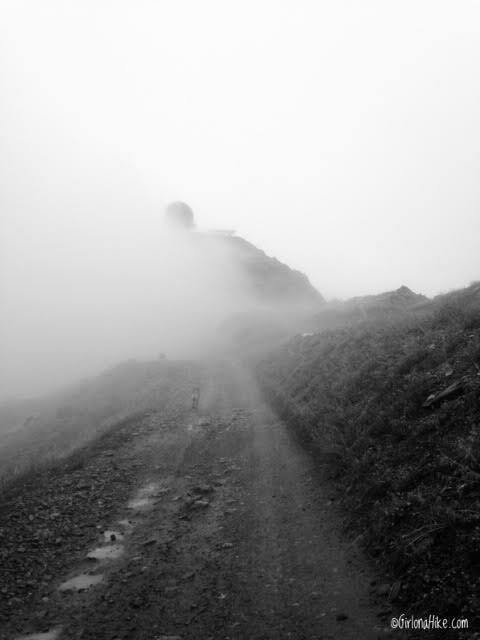 Crazy hike, but very cool photos especially your final one:) Charlie needs a cool weather pack, as well, with a coat!